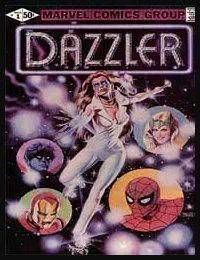 The sleek figure of the beatiful young singer named Alison Blaire, known to her audiences asthe Dazzler , sprints down a dark alley as she is pursued by a carload of would-be assailants. She confronts, and nearly defeats the thugs single-handedly with only her wits, her agility and her still untrained mutant light powers. Things turn when one of the goons shoots her transistor radio, leaving Ali without a source for her powers. Luckily, Spider-Man is in the neighborhood and gives Alison a hand in subduing the bad guys.